I just ordered my October Read of the Month from Amazon, selecting an actual hard-cover book to kick off my school year reading. 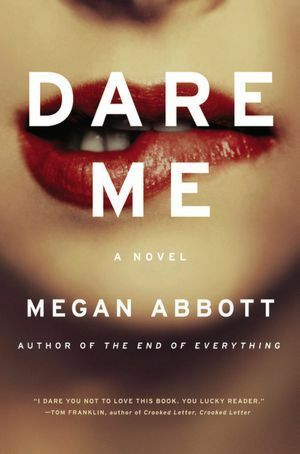 Based upon a recommendation I ordered Dare Me by Megan Abbott. I decided to order the hardcover version of the book so I can add it into circulation at Carlson High School's library once I finish reading. I usually do this with a few books each year to help build my collection when my book budget is low. Dare Me is a young adult novel which revolves around main characters Addy Hanlon and Beth Cassidy. Addy and Beth are senior members of the extremely important cheer squad at their school. A new coach arrives and soon Addy and Beth realize their senior year may not run as smoothly as planned. Now, this may be an odd read for me (teenage girl drama in a high school), but I am always looking for new books to circulate at Carlson High School. Cheerleading is huge at Carlson so that alone would probably make this a popular read. I just want to give it a read-through before I decide to place it out on the shelf. Come back later in October for my full review.....if I am able to finish the book.